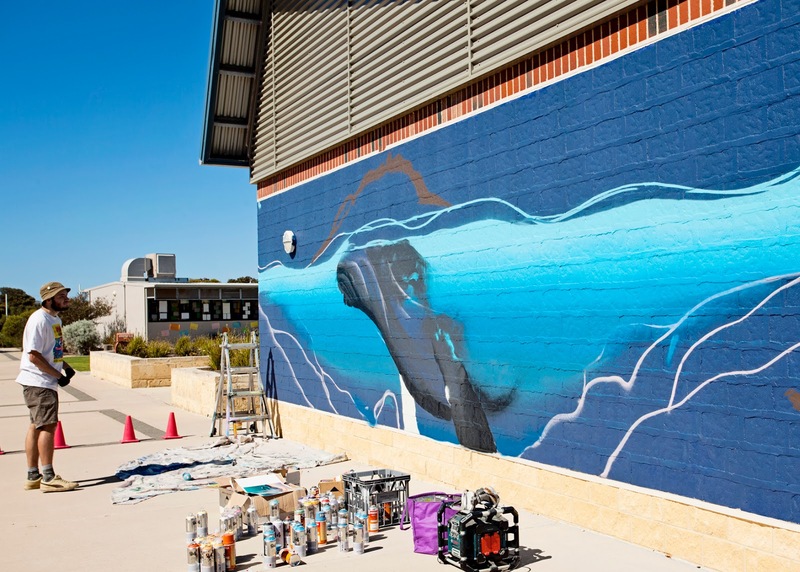 Ravensthorpe District High School was fortunate to have a large mural recently painted by up and coming Perth based aerosol artist, Jerome Davenport. 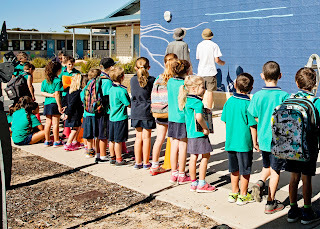 Jerome and his assistant, Ben, were visiting the Shire to complete a mural and workshop at Hopetoun Primary School, organised earlier in the year by the Hopetoun P&C Association and the Ravensthorpe regional Arts Council. 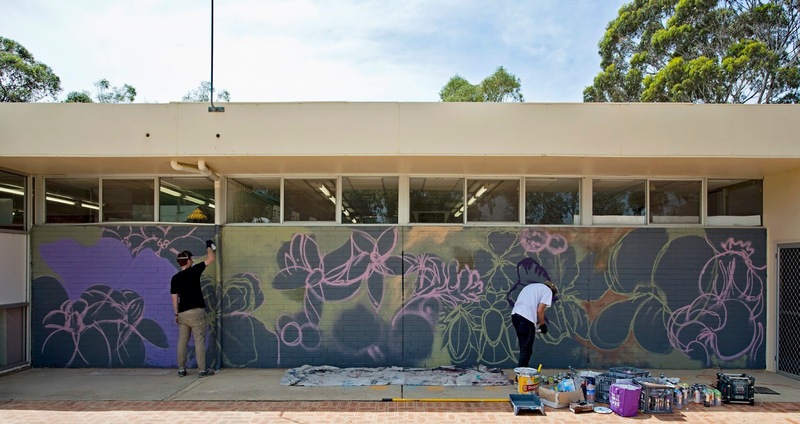 Initially, the Ravensthorpe mural was not possible due to other plans for the wall in question; but when those plans fell through suddenly we were lucky to secure Jerome at short notice. The wildflower design was put together using photographs taken by the secondary photography students. 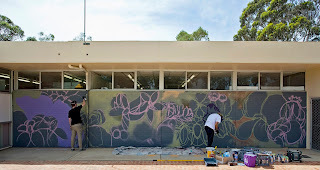 It was an amazing opportunity for the students and staff at the school to be able to watch Jerome and Ben in action; we were all awed by their talent with a spray can and at how quickly the mural came together over the day. Unfortunately all the Cadet students were on a hiking and abseiling adventure that same day, but a few who were collected later in the afternoon from the bus at school were also able to watch the artists working. 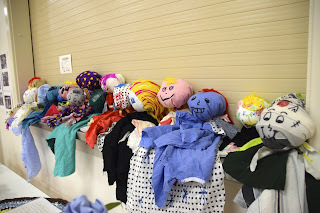 Many thanks to the Ravensthorpe Regional Arts Council, the Ravensthorpe DHS P&C Association and the Ravensthorpe District Art Group for supporting this project at such short notice; your financial assistance is very much appreciated. 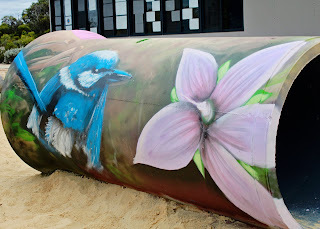 Jerome has completed many murals throughout Perth as well as other regional towns such as Wickepin and Busselton. Even whilst working on our project he was taking calls from another Shire keen to have him! This will be a great talking point for years to come for our school and an experience that the students will never forget. I apologise in advance to all those parents who now face spray can wielding children at home! Finished mural! Photo courtesy of Dene Bingham Photography. 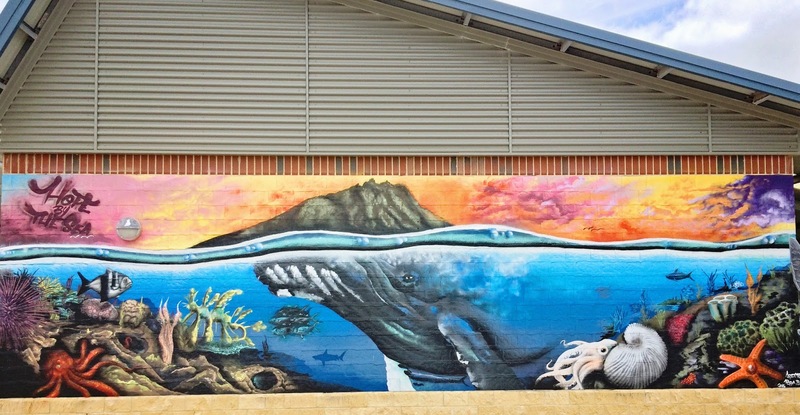 Earlier this year, the Hopetoun Primary School P&C Association developed a project plan to have a mural painted at the school and last week the project was completed. The Ravensthorpe Regional Arts Council came on board to support the project and encourage participation from the whole school community. Jerome Davenport (www.blankwalls.com.au) was commissioned to paint the mural and the design was based on the students own drawings as well as the school motto “Hope By The Sea”. Jerome is a young visual artist based in Perth who completes most of his work using aerosol spray paints. Jerome also painted the concrete tunnel in the school’s nature playground using the younger students hand prints to decorate the inside of the tunnel. 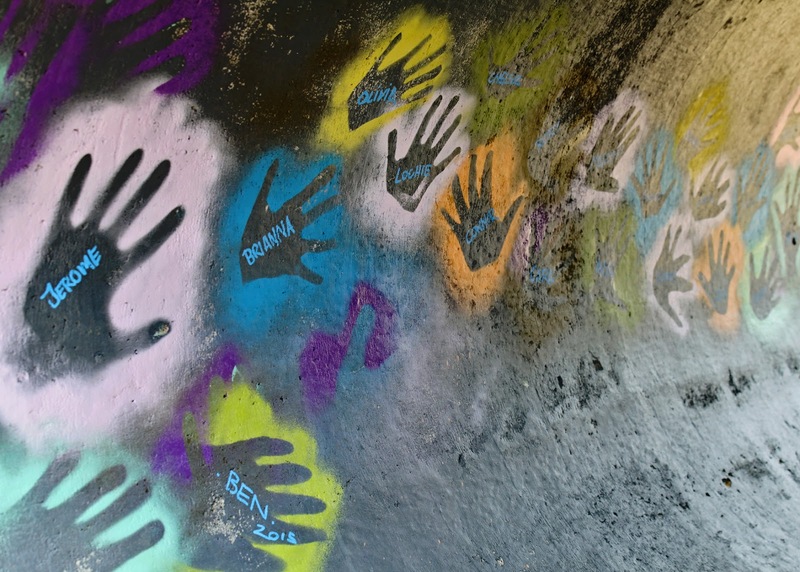 As well as that, Jerome conducted street art workshops with the year 4, 5 & 6 students who enjoyed designing and painting their own skateboard deck. Well done to our P&C project coordinator, Jackie Edwards, who did an amazing job of keeping things organised and on track. Jackie said “Jerome had never been to Hopetoun before. He enjoyed his stay and visiting the National Park which also helped add to his design elements”. The project was proudly supported by Ravensthorpe Regional Arts Council, Shire of Ravensthorpe Youth Network Focus, Hopetoun IGA and Hopetoun CWA. FQM also assisted by providing accommodation for Jerome during his stay. Many thanks to all of our supporters and sponsors. We are very proud to have achieved such an amazing project for our school and community. Photos courtesy of Dene Bingham Photography. Shakira Bratten, Jordan Bingham and Mitch Jones of Hopetoun Primary School. Hopetoun Primary School kids watching on. Inside of Nature Playground Tunnel. thoroughly enjoyed the walk and continued onto another section of the trail after the official trek was completed. He vows to return with his wife next year. 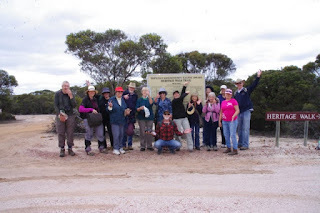 Others came from Bremer Bay, Busselton, Bunbury, Esperance, Perth and our locals many of whom were surprised at how beautiful the walk is. 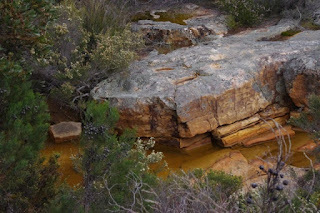 One person commented that it is a hidden treasure and now knows what lies beyond the road between Ravensthorpe and Hopetoun. Before the trek began we all had to scrub our boots down to help prevent the spread of diseases such as dieback thanks to Jessica Wright from R.A.I.N who gave us a talk on the importance of preventing the spread of soil borne diseases weed seeds and such. 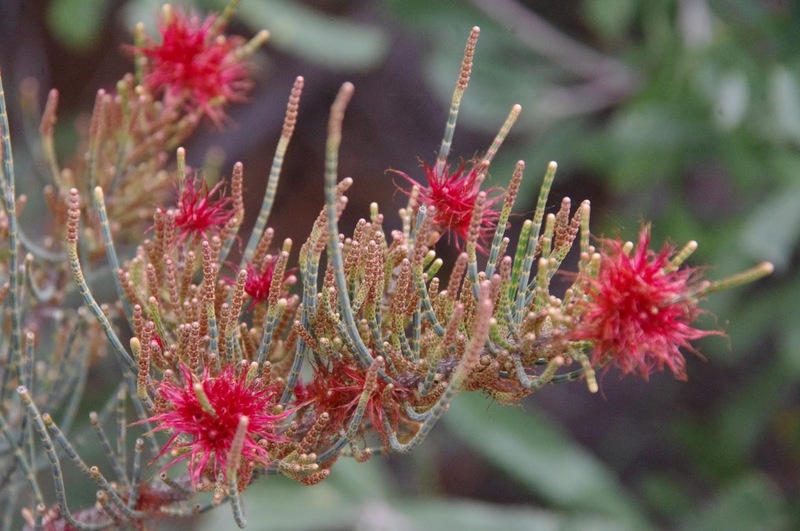 Jessica also spoke on how important it is to maintain our section of the coastal corridor from Hopetoun to Munglinup, and ensuring it remains a biodiversity hotspot. With the weather perfect and wildflowers in abundance we all set out from the old gravel pit where there is a good view of the historic mine sites in the distance and remnants of mine infrastructure. We walked about 2 Kim to reach the trail and were amazed at wildflowers in this heath like bush many would not be seen on the trail. The Heritage trail pretty well follows the Steere River and it criss-crosses across the trail in a few places where remnants of railway bridges can be seen. Seeing the size of the bridge timbers is a stark reminder of the many challenges pioneers in area had when constructing the line. The last train to use the line is now called Lechenault Lady and resides in Margaret River where it graces the entry to the town. 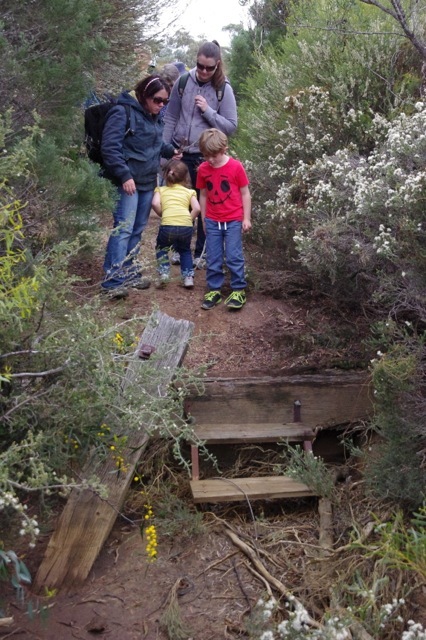 This section of the trail takes you along small gorges; through a stands of Sheoaks and eucalypts, wetland areas and woodland so a variety of plant species associated with these areas were in full bloom and provided us with a good sense of natural change along the trail. 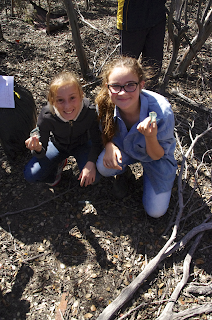 There were many a rare plant found along the trail and nothing excites more than finding that first terrestrial orchid. Morning tea was provided and everyone enjoyed the homemade treats, tea, and coffee. Pat Meadows who was one of the many original people who set this fantastic trail up and has been instrumental in maintaining the trail since its inauguration joined us. The first section was opened in 2001 the 100th anniversary of the 2 towns. 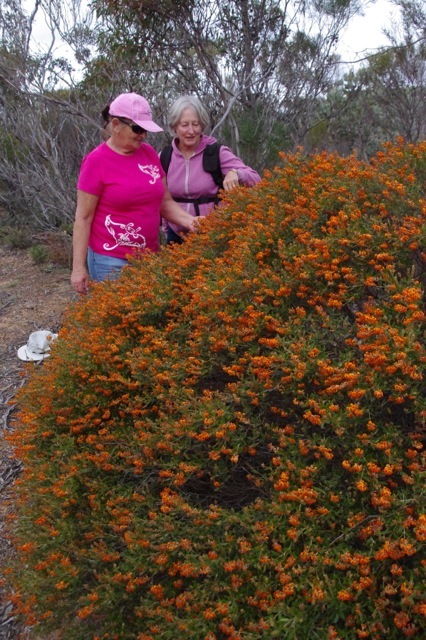 This Wildflower Walk was made possible by the support of the Ravensthorpe Regional Arts Council, R.A.I.N via South Coast NRM. 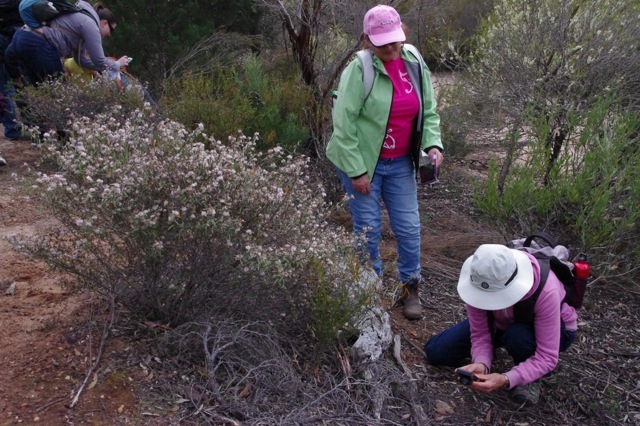 If you would like to know more about the Heritage Trail or other guided walks contact Ainsley Foulds on 0427 383 078. Friday 12th September saw grades 6 & 7 from Ravensthorpe District High School took part in a Conservation and Heritage walk along a small section of the Heritage Railway Trail in Kundip. The walk has been organized and supported by the Ravensthorpe Regional Arts Council, RAIN and the Heritage Trail committee. Jessica from RAIN led the charge with a discussion on the Coastal Corridor and how we as walkers are responsible in keeping the area die back free. All participants cleaned their shoes prior to starting the trek. After a discussion about the Coastal Corridor and how important it is to preserve it for future generations of flora and fauna we set off to walk the 4kms along the railway trail in a loop back to the Kundip Town site. With Sue Leighton leading the trek through the waters of the Steere River and along the way found where the Halfway Pub was located they crossed railway bridge ruins and mastered the art identifying some of the plants on the trail, checking out animal droppings and basically listening to the bush. On arrival back to the historic Kundip Town site the students set off with maps of the old own and went exploring, discovering where buildings and houses once were, finding relics of a past era. As conservationist we all picked rubbish keeping in mind the rubbish left by past inhabitants is considered historic in value. This trek was made possible through the support of RAIN, South Coast Natural Resource Management and Ravensthorpe Regional Arts Council.